It takes nine months from configuration to delivery to produce a Bugatti Chiron with 1,800 parts. As production of one of the most hotly anticipated hypercars of the year gathers speed, Bugatti has given us an interesting insight into the production process of the mighty 1,500 horsepower Chiron. With manufacturing underway at the company’s French headquarters in Molsheim, 12 Chirons are currently being assembled ready to be delivered to customers in the first quarter of 2017, with up to 70 models planned for this year out of the 500 total models that will be produced. As you’d expect, the production process for the complex Chiron is exceedingly long – it takes 20 employees to assemble, and around six months from the start of the production to delivery. Since every Chiron is unique to your personal specification, you can expect a comprehensive configuration process. Simply deciding on a color is a potential mind field. At its most basic level, you can coat your Chiron in a choice of 23 topcoat colors and eight carbon variants. As for the interior, there are 31 different color options for the leather seats alone, and Bugatti says that thousands of other colors options are possible. Or if you’re particularly picky, it will create your own individual colors. Once approved, production plans get underway – on average it takes around nine months from configuration to delivery of the Chiron. One month before production, the Chiron’s bodyshell is assembled with a monocoque and chassis substructure before Bugatti applies up to eight layers of visible carbon fiber paint by hand. Assembly for the Chiron can then commence at Bugatti’s “Atelier” production building where its Veyron predecessor was also built. However, the Chiron is so advanced that the facility had to be modified to accommodate its more complicated production process. Exterior components are now pre-assembled, and a new rolling dynamometer had to be developed to handle the 1500-hp Chiron. New conductive flooring even had to be developed to allow dissipation of any electrostatic charges. 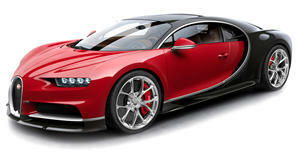 You won’t find any conveyor belts or robots at Bugatti’s production plant. Instead, people work on assembling components in 12 individual stations like a workshop of a Formula One team. The powertrain, for example, is built at Volkswagen and then installed onto the chassis in one of these stations. Thanks to lightweight materials, the powertrain only weighs 628 kilograms which, despite its increased power output, isn’t any heavier than the Veyron. Assembly of the chassis in each station takes three employees one week, but in contrast to a conventional production line, each employee must be able to assemble the entire chassis including the rear end, monocoque and frame. From here, the Chiron's rear end is built around the powertrain, and the monocoque and front end are joined together. Unsurprisingly, cooling is crucial for the Chiron, which is why it’s equipped with three water pumps – the cooling water pipes have the same diameter as a fire brigade’s spray lance. In total, there are more than 1,800 bolted joints on a Chiron. The monocoque is then joined to the rear end with 14 titanium bolts to save weight, as each bolt only weighs 34 grams. Once the wheels are bolted to the chassis, it moves onto the filling unit station where the engine and transmission oil, brake fluid, hydraulic fluid and coolant are filled into the Chiron. At this point, the 16-cylinder engine is started for the very first time, which will surely send shivers down your spine. Bugatti’s rolling dynamometer had to be extensively modified for the Chiron with larger cables since the previous one couldn’t withstand the potent power and torque of the Chiron, which is tested at simulated speeds of up to at full power 200 km/h (124 mph). It’s the most powerful rolling dynometer in the world, with a current of up to 1,200 amps. The Chiron’s exterior parts, made entirely from lightweight carbon, are then installed, which takes around three to four days. Because the individual parts are large and fragile, a pre-assembly stage was introduced for the Chiron at Bugatti’s new technology center. It then undergoes intensive water testing to ensure there are no leaks, before the interior is then fitted. During a final test drive on a runway where it reaches speeds of over 250 km/h (155 mph), it wears a transparent plastic foil which takes a whole day to apply and remove and has its original wheels and underbody removed. Lastly, the Chiron undergoes final cosmetic checks and optimizations which can take weeks if any component isn’t up to standard. Only when the Chiron has passed Bugatti’s rigorous quality assurance are you finally allowed a test drive, before delivery can then be arranged.